I used to have regular mani/pedis but, in an effort to save money, have started doing my own at home. Okay, I still splurge occasionally. 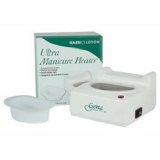 Anyway, I loved the warm lotion that my manicurist used to soak my nails in. After they were don’t soaking she would massage my forearm with the left over lotion, so I asked her what it was…”oh, I make my own.” What? Okay, whatever. So one day I’m cruising through Sally’s Beauty Supply because I want to buy my own warm lotion soaky thingy to do my own manicures. 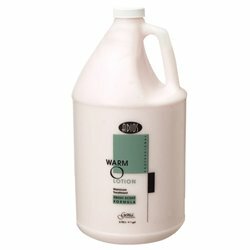 Imagine my surprise when I find Gena’s Fresh Scent Warm O Lotion in a gallon bottle. I open the bottle and smell it and, low and behold, it’s the EXACT SAME HOMEMADE LOTION. It’s normally 18.99 on Amazon or at Sally’s, but this fine day it was marked 50% off. I use it on my hands and arms every day as a body lotion. Fantastic! Cheap! Smells like roses, but very subtle, and when I want I can heat it my next favorite thing. I know what you’re thinking, but this is really a nice little item. There is something very decadent about sitting on the couch and soaking your nails in warm lotion. I feel girly, girly when I do my own nails. The IT Crowd. A coworker turned us on to this UK series about a company iT Department and their manager. It is great! Be warned, it contains bad language and sexual situations (think the UK version of The Office). Anyway…I think it’s wonderful and my husband and I and our boys laugh until we cry over the antics of Roy, Moss, and Jen. You can get it on Netflix or stream from Channel 4’s website. We’ve watched the first 3 seasons and are awaiting the fourth in the mail. Horseradish sauce. I use it on hot dogs, hamburgers, and toasted ham sandwiches. No one else in the house likes it so it stays in the fridge and is always available. Plus it opens up my sinuses. 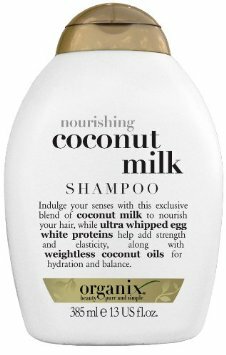 Organix coconut milk shampoo and conditioner. I found this on sale at Walgreen’s. I think it’s too expensive full price. I brought it home and my husband, who is frugal about soap and shampoo, loves the conditioner so much he buys it full price. I’ve tried other Organix products, but again only when on sale.